New Car Test Drive names the 2016 Chevrolet Volt Best Commuter Car. The all-new Chevrolet Volt is the Best Commuter Car for 2016, according to the editors at New Car Test Drive. Redesigned and re-engineered for 2016, the Volt is a smooth five-door hatchback that can run on pure battery power for the average commute, yet it has a small gasoline engine that extends its range to 340 miles, eliminating any anxiety about being left on the side of the road. Drivers who suffer long daily commutes to and from work in heavy traffic will find the Volt smooth, quiet and efficient. Chevrolet Volt owners will spend most of their time running on battery power, most using no gasoline during a routine week of commuting. The 2016 Volt can go up to 53 miles on all-electric power. Just plug it in each evening and it’s ready to go the following morning. Take a longer trip and, when the battery power runs down, a small gas engine starts and the car continues as if nothing changed. The switchover is smooth, barely noticeable. The 1.5-liter engine that acts as a range extender runs on 87-octane Regular gasoline. So if the grid shuts down or if recharging is inconvenient you can keep refilling the tank. However, for most commuters the gas engine will remain silent as they rely on smooth, quiet electric power for their car. The Volt is capable of accelerating from zero to 60 miles per hour in about 8 seconds, according to Chevrolet. That’s adequate performance, neither sluggish nor quick. Its smooth ride, smooth power delivery and smooth brakes reduce the chance of coffee spillage in the new Volt, making it an enjoyable commuter. 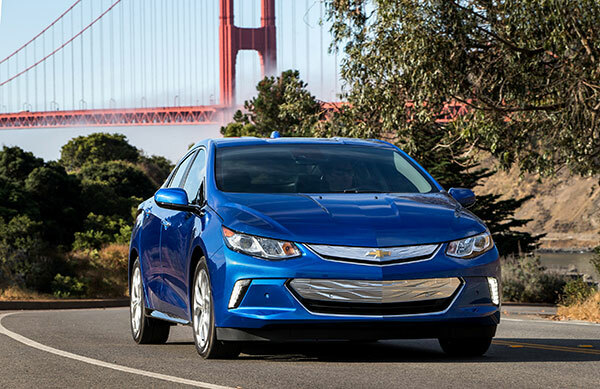 Though incredibly sophisticated and unconventional, the Volt is as easy to operate as any conventional car. No special knowledge is needed to operate it other than plugging it in each evening. Traditional knobs and buttons have replaced the stylish controls used on the first-generation model, making them easy to use underway. All controls are intuitive, and the instruments are legible and easy to read and understand. An eight-inch touchscreen at the top of the center stack is crisp, attractive and easy to operate. Below are clearly labeled hard buttons for climate control. Intuitive controls make for a good commuter car. The new Volt is better looking than before, more mainstream in appearance, yet we think it remains distinctive. Its shape suggests a coupe, but the back door is useful when expediently tossing stuff inside. 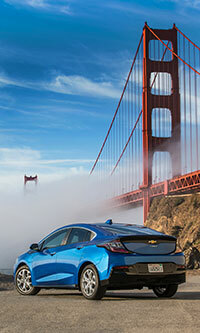 The 2016 Volt was chosen as the Best Commuter Car by New Car Test Drive editor Mitch McCullough, Green Car Reports editor John Voelker, and The Car Connection deputy editor Bengt Halvorsen.